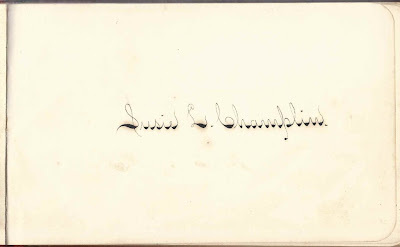 1880s autograph album that belonged to Susie L. Champlin, who was a student at East Greenwich Academy, presumably in the Class of 1889, at East Greenwich, Rhode Island. Susie signed two pages at the beginning of the album. 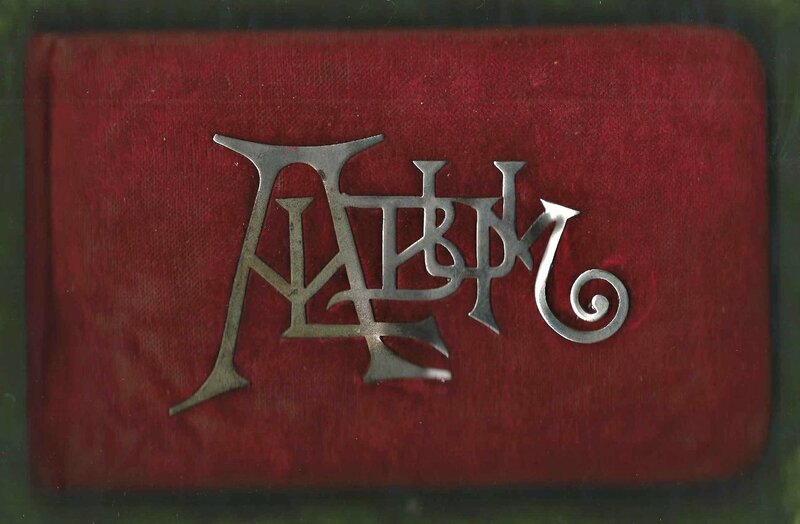 The album is 7" x 4-1/4" with puffy red velvet covers and a metal piece forming the word "Album". 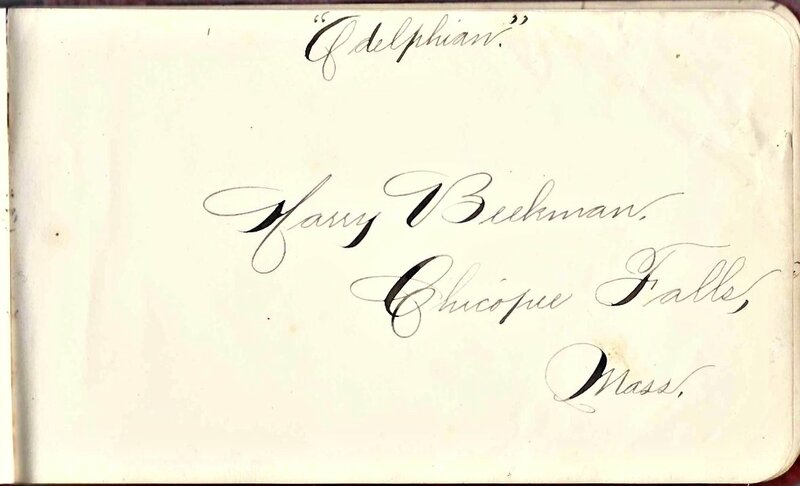 An alphabetical list of the 68 people who signed pages in the album, including Susie herself, her classmates and friends, appears at the end of this post. 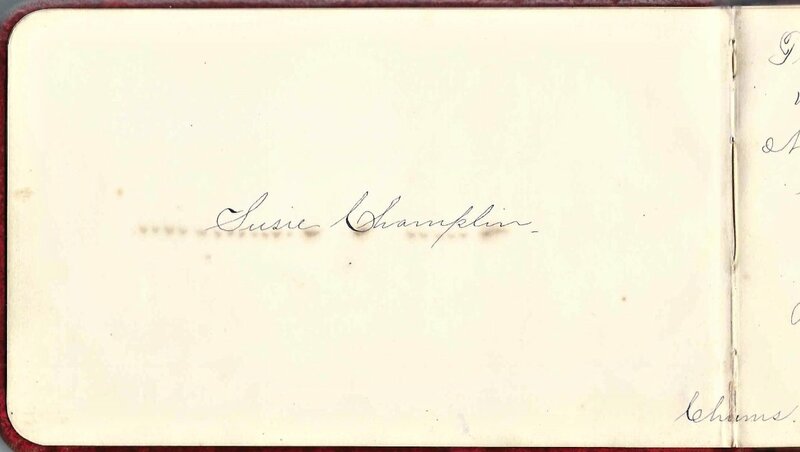 Two other people named Champlin signed pages in Susie's album. 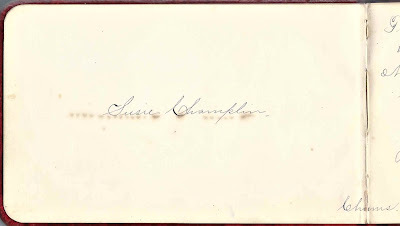 M. Frances Champlin of East Greenwich, Rhode Island, signed a page in 1889 and noted that it was "Inauguration Day - Harrison and Morton" [Pres. Benjamin Harrison and Vice President Levi P. Morton]. Some of the signers indicated what might have been societies they had joined, such as "Philo", "Adelphian" and "Aletheon [notice that M. Frances Champlin, who page appears above, was an "Aletheon"]. 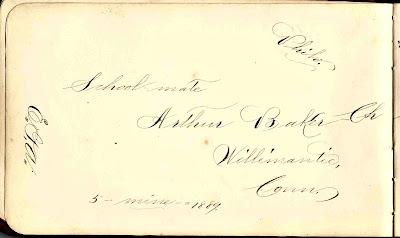 Arthur Baker of Willimantic, Connecticut, a "Philo", signed a page at East Greenwich Academy in 1889. 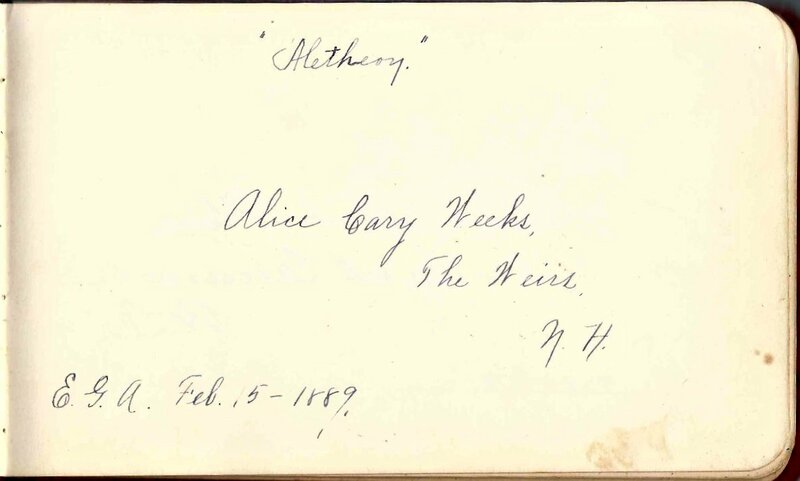 Alice Cary Weeks, an "Aletheon", of The Weirs, New Hampshire, at East Greenwich Academy on 5 February 1889. Harry Beekman, an "Adelphian", of Chicopee Falls, Massachusetts, signed a page. If you have information on Susie L. Champlin or any other signers listed below, please leave a comment or contact me directly. Anonymous. Written in the corners: S.I.G. ; J. G. B.; C.E.C. ; J.G.S. 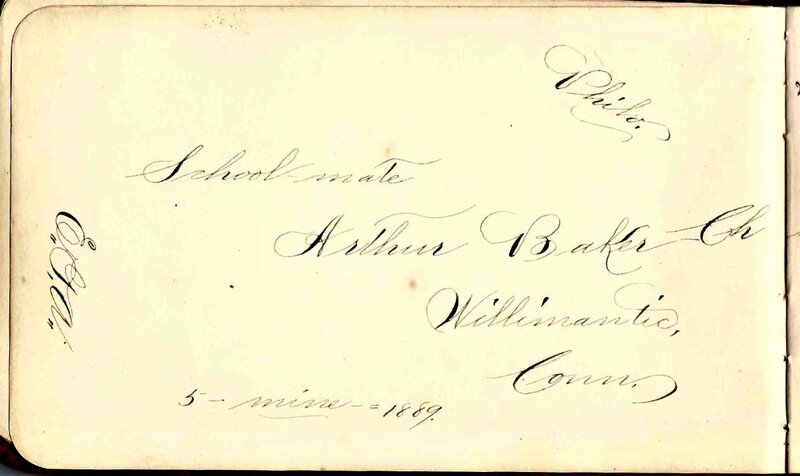 Arthur Baker of Willimantic, Connecticut, signed at East Greenwich Academy in 1889; "Philo"
William Baker of Chester, Connecticut, signed at East Greenwich Academy on 24 April 1889; "Adelphian"
Fitch B. Barber of South Manchester, Connecticut, signed at East Greenwich Academy on 2 May 1889; "Philo"
Jessie R. Barricklow of Cady, Ohio, signed at East Greenwich Academy, from "Sept 11 to Nov 23/88"
Harry Beekman of Chicopee Falls, Massachusetts; "Adelphian"
James M. Bennett of Hope Valley, Rhode Island, signed at East Greenwich Academy on 25 April 1889; "Philo"
William H. Bowker of Stafford, Connecticut, signed at East Greenwich Academy on 13 May 1889; "Philo"
Cliff C. Bradford of Westerly, Rhode Island, signed at East Greenwich Academy on 12 May 1889; "Adelphian"
Roby B. 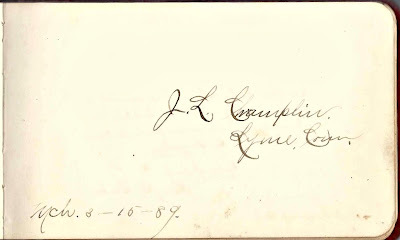 Branch of Nichols Academy at Dudley, Massachusetts, signed at Providence, Rhode Island, "Your room mate's chum"
Kittie H. Burton of North Providence, Rhode Island, signed at East Greenwich Academy on 12 February 1889; "Aletheon"
M. S. Case of Little Compton, Rhode Island, signed at East Greenwich Academy on 8 May 1889; "Adelphian"
M. Frances Champlin of East Greenwich, Rhode Island, signed in 1889. "Inauguration Day - Harrison and Morton" [Pres. 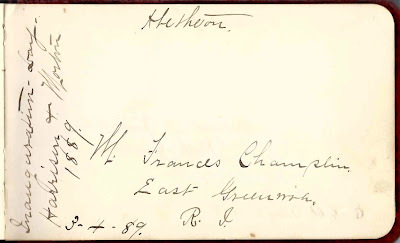 Benjamin Harrison and Vice President Levi P. Morton]; "Aletheon"
Frank J. Howard of Willimantic, Connecticut, signed at East Greenwich Academy in 1889; "Philo"
A. 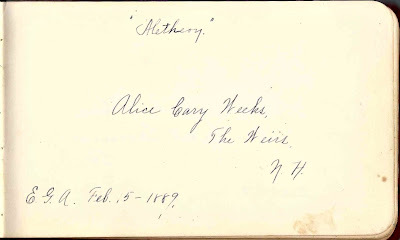 A. Kenyon of Carolina, Rhode Island, signed at East Greenwich Academy in 1889, "Class of 89"; "Philo"
Elvy Perkins Low of Brookline, Massachusetts, signed at East Greenwich Academy on 29 January 1889; "Aletheon"
F. Marchant of Philadelphia, Pennsylvania, signed at East Greenwich Academy on 21 November 1888. "Winsor House, Nov. 17, 1888"
E. L. Montgomery of South Manchester, Connecticut, signed on 29 April 1889; "Philo"
E. F. Nightingale of North Attleboro, Massachusetts, signed at East Greenwich Academy on 10 May 1889; "Philo"
James O'Connor of Chester, Connecticut, signed at East Greenwich Academy on 27 April 1889; "Adelphian"
Charles A. 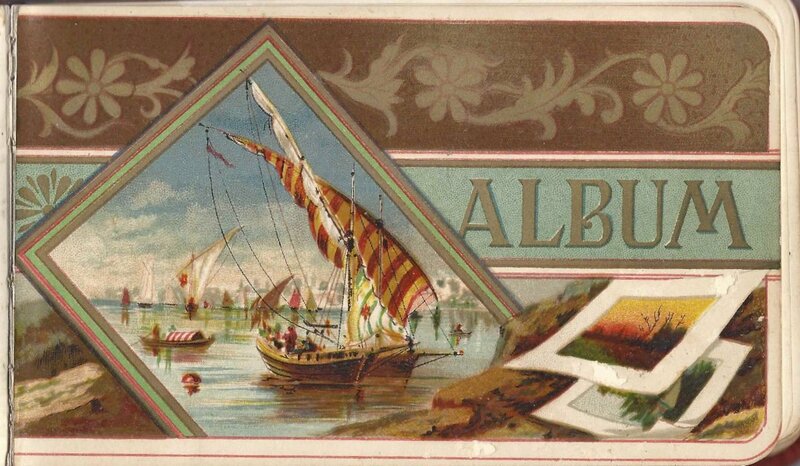 Place of East Greenwich, Rhode Island, signed on 9 May 1889; "Philo"
G. H. Potter of South Scituate, Rhode Island, signed at East Greenwich Academy on 16 May 1889; "Adelphian"
Ed. 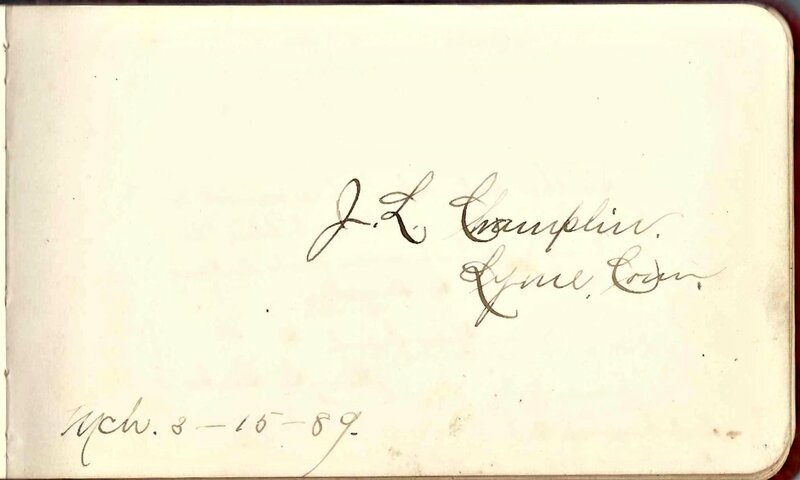 J. Prest of Uxbridge, Massachusetts, signed at East Greenwich Academy on 20 November 1888. Edward J. Prest; "Adelphian"
W. L. Snow of East Mansfield, Massachusetts, signed on 18 May 1889. "Class of '89 [presumably at East Greenwich Academy]; "Philo"
Arthur T. Talmadge of Westfield, Massachusetts, signed at East Greenwich Academy on 29 April 1889; "Adelphian"
Henry A. Thayer of East Blackstone, Massachusetts, signed at East Greenwich Academy on 14 May 1889; "Adelphian"
W. Sherman Thompson, signed at East Greenwich Academy on 14 May 1889; "Philo"
Percival P. Tourtellotte of North Grosvenordale, Connecticut, signed at East Greenwich Academy on 21 May 1889; "Adelphian"
Nan Laurie Weeks of Weirs, New Hampshire, signed on 14 February 1889; "Aletheon"
Susan's own page has this comment: "Census: 1880 North Stonington, New London Co., Connecticut. Note: age 10, w/ aunt Frances" so maybe her parents had died. If you follow her mother's links backward, you find Susan's maternal aunt Frances Ann Chesebro who married Abram Benjamin Main. 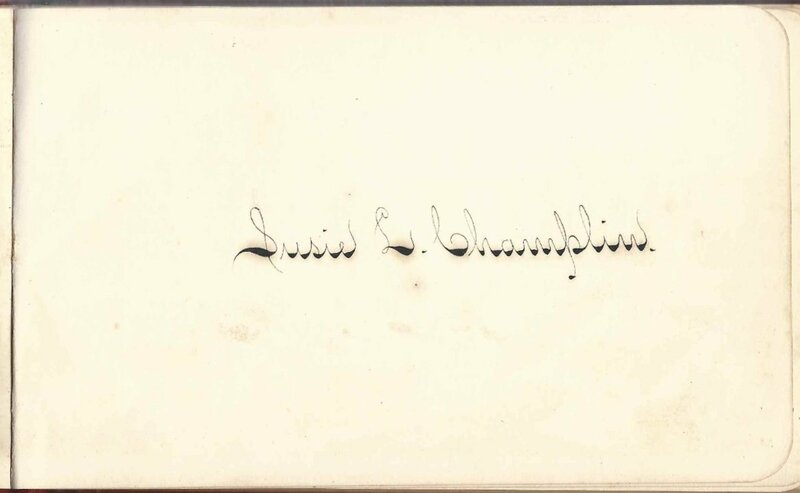 You'd think ancestry or familysearch could find Champling for Champlin. Ed, I can't thank you enough for your research to pinpoint Susie L. Champlin as Susan Lena Champlin, daughter of John M. and Lucy Mary (Chesebro) Champlin!